As many as a third of "spelling" errors in English involve homophones, words that sound the same but are spelled differently. This book helps teachers tailor instruction to their own students' needs with an all-purpose lesson for introducing commonly confused homophones, worksheets for 130 sets of commonly confused words with answers, definitions, parts of speech, word histories and mnemonics. 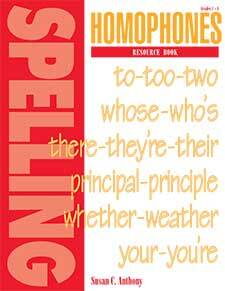 All homophones taught in Spelling Plus and Spell Well are included.